It’s the day after my tenure hearing, and I am feeling relieved. Yes, I have a couple of months to wait for the official letter…but in the meantime, it’s back to life, back to reality. I have manuscripts to finish, syllabi to prep, lectures to dust off and update. As I sit here, trying to motivate myself, Karagöz is dodging invisible dust as he does back flips across the back of the couch. He is doing all he can to distract me. I think he is feeling a bit oppositional and empowered since the writeamatrix is off in the Tierra del Fuego on vacation, and he feels he has extra opportunity to sway me away from writing now. Although the immediate pressure to write my academic world stuff is off for now (I mean, I’m not planning on becoming a SLACKER or anything), I am exhausted from writing. I am so exhausted from writing, that my writing energy might as well look like the flaccid tripe pictured here. Karagöz is screeching with delight at this image, putting his puppet hands annoyingly in the way of my eyes, repeatedly, just to bother me. He is always the trickster, the worst and most base of impulses-kind-of dude puppet. Why am I so tired, you may ask? Well, I think I have spent SO much time on academic writing, that I have not nurtured my creative side. So, I am trying to post everyday here on the slowly-by-slowly blog because THIS type of writing is fun and is flowing out of me as of late. For me, this personal writing is an effort to maintain the a bit more balance on the personal side of my life, and not let it be subsumed by the professional side of me. I also love to write – but buried that impulse for years and years, as I wrote about here. This past summer, I read Natalie Goldberg’s famous book, Writing Down the Bones, and learned of the importance of writing a chunk each day – no matter what – even if it was drivel or a bunch of nonsensical words all in a line across the page. I started this “writing practice” while on Bozcaada and have not stopped, well, not too much anyway, other than the spell of time I fell ill this fall. I do cheat, though, and sometimes do a lot of writing ahead of time and post it for the next few weeks or so…so, I am an imperfect human and writer, but really, is there any other kind? Most of what you will read in this blog is written in one sitting – some of it is taken and “massaged” from past writing about the life and times of L. and M. on their cross-cultural marital roadtrip…but in any case, today, I am frustrated that I can’t jumpstart myself to keep going on the last few writing projects I want to finish before the new semester sets in, but as usual, Hacivad Bey has showed up to save the day and show me the light and show me the way. So, let me take this image of tripe, giggle a bit at Rumi – and keep calm, but carry on. All I can think of is the İşkembe çorbası (“ish-kehm-beh chore-bah-suh”) tripe soup that M. tells me about – only to be consumed in the winter months – and especially to be consumed after a night of drinking (what would he know about that? ancient history, he tells me, but potent history). This image, unfortunately, stops all words for the moment – maybe enough to get me going again on these manuscripts! This entry was posted in On writing about my life with the Karagöz puppets, Visits from the Karagöz puppets and tagged Bey, Karagöz and Hacivat, Natalie Goldberg, Rumi, stories, writing, Writing Down the Bones, İşkembe. Bookmark the permalink. Tripe is disgusting! This is not my opinion, it is a proven fact – my father forced me to experiment repeatedly and it made me sick and got me punished every time. Cause and effect – for every action there is an equal and opposite reaction! Experiment successful and peer reviewed by my sister – conclusion? DISGUSTING!!! 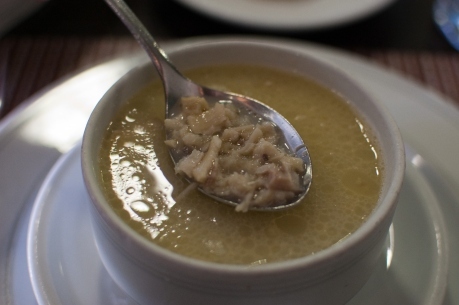 you have to have tripe soup in Istanbul, it is awesome and i bet you will like it, if we have any chance to meet in Istanbul one day I will take you. M. – only you would know that Gaugin brought CANNED TRIPE with him on his journey. Alan – M. is well known for his culinary nose, it never lets one down, although it may not be enough to overcome childhood memories!!!!!!!!!!!!! !